News and articles from Mountain Leader, Coach and Photographer Carl Bullock. Join the mailing list below for updates and special offers on various coaching courses. I've always been fascinated by long exposure images, I love the tranquility it can give to water scenes, the drama it can enhance on stormy days and the way it can make bold objects stand out from their surroundings. It often takes a creative eye to visualize the end result, either in knowing exactly what you want to start with or by understanding what an image may look like should the opportunity and conditions arise. Long exposures can be classed as an exposure of anything from just a few seconds to as much as several minutes. The length of which is decided ultimately by what the photographer wants to achieve, often it is down to experience and practice. It's usually a case of combining the necessary Neutral Density (ND) filters and adjusting the aperture to suit the situation or desired effect; which means the usual method would be to use aperture priority up until the point where you exceed your camera's longest possible shutter speed where you would then need to switch to bulb mode and time it or use a digital shutter release (recommended). As is always the case, I've spent many moments viewing youtube or reading articles in magazines studying this artistic side to photography, trying to build my own understanding of it. Therefore in this first part to this blog post I'm going to keep it simple and explain some of the findings I've had along the way, during my trials and errors. In part 2 will go more into the techniques and workflow I use. Above: Bold subjects often help, although I feel that this one would have been better captured had I had the time to wait for the tide rise a little further cancelling out some of the clutter. The SRB Photographic Circular ND1000 (10 stop neutral density filter) is my filter of choice for long exposure shots. I was especially pleased to find that it had won the Digital Photo Magazine's 'Gold Award' in a group test, beating the LEE Filters equivalent which is often used by professionals the world over. There is a slight colour cast but you won't find any on the market that doesn't have at least a little. If you have a rock steady tripod (see equipment below for a tip on how to check it's rock steady) it will be as sharp as any other 10 stop filter you can find. There is a square version of the filter which came of slightly worse in image quality stakes during the above magazine's group test, however I personally feel that it may well be down to a number of reasons, including wind, tripod, light change etc. It appeared to be that close, I would have to see several results to take it for granted. I haven't tried the square version as yet but it is definitely on my shopping list, mainly because the square versions are easier to use. Tripod - This is an absolute must, due to the length of time the shutter is open. The sturdier the better, particularly on those windy seascape days. Long exposure calculator - there are many charts available online and you can also get phone apps to assist you with this. Technically not essential, but in the early days of trying or if you're not up for calculating it in your head they can be. A good long exposure filter - typically 10 stops but you can also use a lighter one in conjunction with a smaller aperture, it really depends on the ambient light. A decent shutter release - I use a cheap one from Yongnuo which does exactly the same as the big brands for much less money. Using a shutter release negates the requirement to press the shutter on the camera potentially causing camera movement. Weather Apps - I use Weather Pro as it gives me a very detailed breakdown of humidity, cloud percentages, air pressure, wind speed and direction etc. Shutter Calculator Apps - there are many available out there and plenty of them are free, don't pay for this kind of thing when you have the info you need at zero cost. I no longer use one as I can calculate it relatively quickly in my head. Besides my filter came with a very simple to use printed chart. Tides App - I use one called Tide Times, it's very simple to use giving me details of the tide heights in my local area and anywhere else I search for. Alternatively, most seaside towns and fishing village shops can provide you with small pocket sized charts with the tide times printed. Telephoto zoom lens - These are useful for compressing the image and focusing the eye in onto bold subjects some of which are often hard to get to at coastal locations. 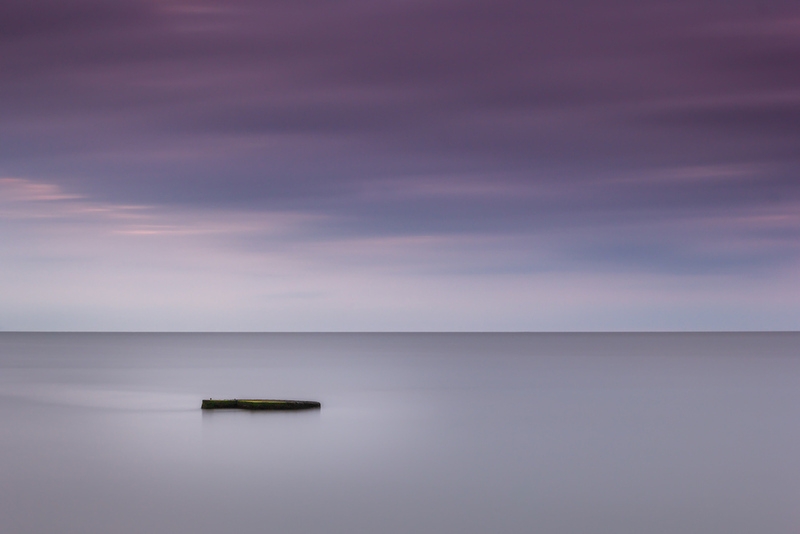 Spirit Level - This is one of my favorites for giving me some indication of how much the wind is effecting my tripod. The slightest wobble will be apparent in the spirit level bubble, and even more apparent in an enlarged print of the finished image. If I see wobble in the level, then I know I need to do something to protect the camera from the wind. Do plan ahead if you know exactly what subject you want to shoot. Check the tide times, check the weather (clouds can be a huge part of the overall image) and check for sunrise and sunset times should that be an important factor to your image. Do remember to focus manually prior to applying the filter and this goes for when you recompose too. Do allow a little extra time or reduce the time accordingly when calculating the exposure during those rapidly changing light levels at either end of the day. Do remember to clean both the lens and the filter before applying it. Don't forget the Do's above. Don't forget to take into account where your tripod is. Will it sink slowly in the sand, will it wobble with vibration on a pier or walkway when vehicles pass etc? Don't take risks to get the shots, be sensible, don't get cut off by tides waiting for the right level of water. Don't be afraid to increase your ISO to what you consider an acceptable level, in low light it may be necessary. Above: The breakwater near the tower at Walton-on-the-Naze, here I had to adjust the length of exposure to get the desired effect in the clouds. Matt Brodie on Youtube - A simple set up and some post processing in Lightroom. The Landscape Photography Workshop - A great book on all things Landscapes also has a section on Long Exposures. Digital-Photography-School - A myriad of articles on Long Exposures. Thank you and welcome to my blog, you will now receive an email requesting you to confirm subscription, please click on the relevant link. I look forward to reading your comments. For regular updates on new images. Music Photography & A Legend Calls!